Breakfast Links are served - our weekly round-up of fav links to other web sites, articles, blogs, and images via Twitter. • Patient hero: John Henry and the earliest American account of post-traumatic stress. • Margaret Hamilton, the woman who put a man on the moon. • The wedding feast of Philip the Good, Duke of Burgundy, and Isabel of Portugal, 1429. • James Leman and the ravishing silk designs he created in 18thc Spitalfields. • One of history's most reproduced "wallflowers": 19thc beauty, muse, and opera singer Lina Cavilieri. • Image: A large, rare, and exquisite 17thc lady's needle lace toilette. • The storied 18thc romance of Lady Frankland, born a fisherman's daughter, may not be the idealized fairy-tale it once seemed. • Sugar versus honey in Byzantine recipes. • Memento of a spy: the leather pocketbook British spy Major John Andre was carrying when he was captured by American soldiers, September 1780. • Coin-op cuisine: when the future tasted like a five-cents slice of pie. • Diverse entertainment at the 19thc Eagle Tavern in London. • It's been fifty years since Britain left. Why do so many African judges still wear white Georgian-style wigs? • Image: Records show Queen Alexandra ordered matching shoes and stockings like these c1890. • Queen Victoria's Hindustani diaries. • Respectfully presented: an elegant "presentation sampler" worked by a 12-year-old Philadelphian in 1822. • Thomas Rowlandsond's Lower Orders. • In the 1930s, New Zealand had an epidemic of exploding pants. • A calvary helmet designed by Lord Byron. • The world's smallest crime scenes from the 1940s: the Nutshell Studies of Unexplained Death. • When the King of France lived in England. 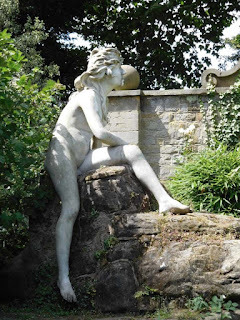 But among the artists, aristocrats, and would-be monarchs who called York House home, the one who caught my attention was Sir Ratan Tata—because he’s the one who’s responsible for installing these statues in the garden. They’ve led an exciting life, certainly. They belonged originally to Whitaker Wright, who killed himself with cyanide after a conviction for fraud. Sir Ratan, who ran a then-legal opium importing business, socialized with King George V. During WWII, the ladies had to be camouflaged under some sort of dark substance, to avoid attracting the attention of German bombers. I will admit that some of the poses puzzled us—and we’re not the only ones. Those responsible for installing the statues were puzzled, too, because they had to figure out how to arrange the figures without guidance from either the artist or written instructions. 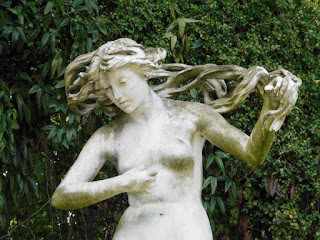 Furthermore, these Naked Ladies were meant to be part of a larger ensemble, but the other statues went elsewhere—possibly with the instructions. Still, while the arrangement may not be what the artist originally intended, it certainly does stop a visitor in her tracks. You can learn more about the statues and their history at the York House Society website, in this PDF (this material appears on a sign near the statues as well, which proved impossible to photograph), at the Twickenham Museum site, and of course at Wikipedia, where you can learn more about York House as well as the Naked Ladies. 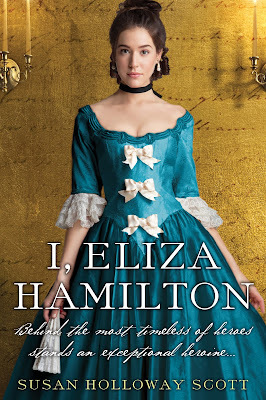 It's Publication Day for I, ELIZA HAMILTON! At last, at last: my new historical novel, I, ELIZA HAMILTON is now available via on-line websites and in bricks-and-mortar stores, and in every format including print, ebook, and audiobook. If you need to be tempted further, you can read a description as well as the prologue and first chapter here. 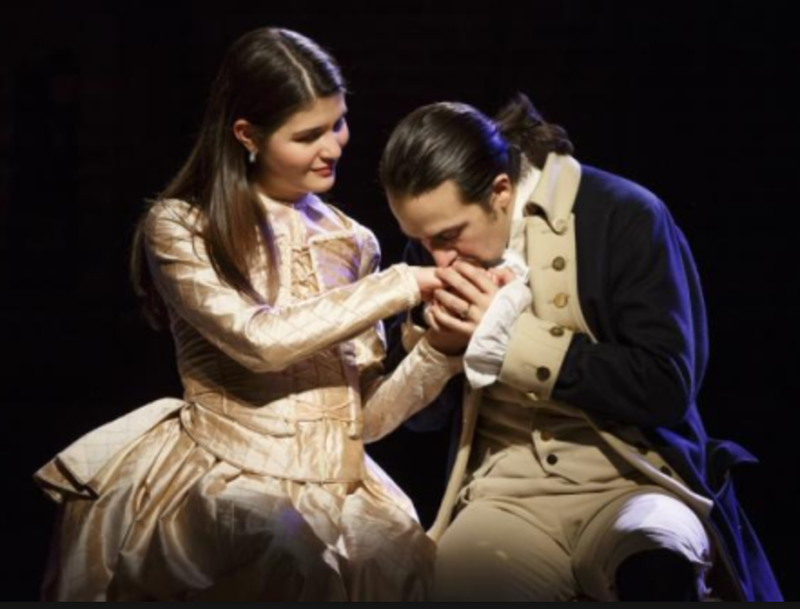 You'll find plenty of additional background about Eliza and Alexander Hamilton and the tumultuous times in which they lived here on my website blog. There's also a Behind-the-Book feature at BookPage. So far the initial reviews have been wonderful, including a starred review in Publishers Weekly and more than 65 five-star early-reader reviews on Goodreads. But the only opinion that matters now belongs to you, dear readers. 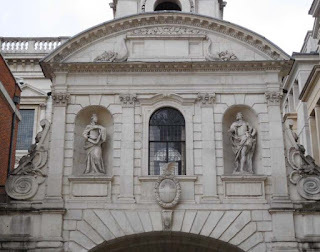 In Dukes Prefer Blondes, I mention Temple Bar, a gateway that stood where Fleet Street meets the Strand. Through it have passed, along with the usual traffic, monarchs dead and alive. On the main arch, on iron spikes, traitors’ heads were on display. The structure still exists, as I set out to prove to my satisfaction during my stay in London, and this existence, to me, is a miracle. It is London’s only surviving gateway, and the story of its survival includes a trip to Hertfordshire. Built in 1672, the time of King Charles II, it was taken down, stone by stone, in 1878, because it was in the way. It had for years obstructed traffic, and now it was hampering construction of the Royal Courts of Justice. Unlike other historical structures, though, Temple Bar was saved from complete destruction. The stones weren’t carried off and used to build something else. They were saved, in hopes of a restoration. Nobody quite worked out how to do this, though. 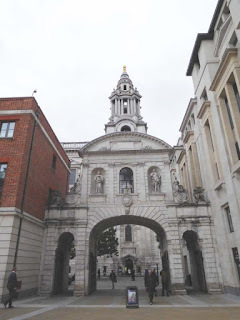 Then, ten years later, at his wife’s instigation, Sir Henry Meux bought the 400 tons of stone from the Corporation of London and rebuilt Temple Bar as a gateway into his estate at Theobalds Park in Hertfordshire. Apparently, it did the trick of enhancing Lady Meux’s social status, as she’d hoped: It’s believed that she dined in its upper chamber with, among other notables, the Prince of Wales and Winston Churchill. Temple Bar remained at Theobolds Park until 2004, when it returned to London, to be reassembled, stone by stone, in Paternoster Square. The History of Temple Bar site and the Wikipedia entry will offer you more details. I offer some pictures. Clicking on the image will enlarge it. • Newly digitized to view on line: spectacular example of colonial calligraphy by a Boston writing teacher. • Night witches, Nazi hunters, heroes: the women of Aviation Group 122. • For a stylish Victorian lady, one's gloves must always be a shade lighter than one's dress. • The confession of Mary Voce, who inspired George Eliot. • Born to a one-time slave, Ruth Odom Bonner's life reflected America's "arc of progress." • Image: Rachel M. Thompson & Catherine Jay Moore, early tech pioneers, from Radio Age, January 1924. • Scientists once dressed frogs in tiny pants to study theories of reproduction. • There never was a real 17thc Tulip Fever. 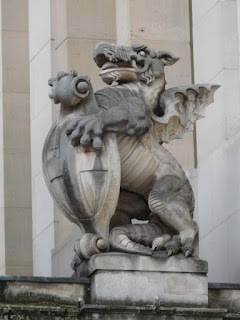 • Not seen, not heard: the Ladies' Gallery in the old Palace of Westminster. • Theatrical cosmetics in the 19thc: making face, making "race." • The Trotula: Women's Health Care in the Middle Ages. • Explore Mary Wollstonecroft's legacy. • Image: New acquisition by the Victoria & Albert Museum - Queen Victoria's sapphire and diamond crown, designed by Prince Albert. • President Benjamin Harrison and the body-snatchers. • The most inspiring hot-air balloon ride ever. • A ditch runs through it: Robert Livingston and the first Erie Canal. • Children of convicts transported to Australia grew to be taller than their peers in the UK. • The fashion for white mourning. • In the summer of 1792, a ferocious (and mysterious) beast terrorized the countryside around Milan. • To read online - anonymous visual journal depicting an entire trip through West Indies in 1815. • Image: Geta shoes made of solid iron and worn for martial arts training. We Two Nerdy History Girls are partial to automata and other clockwork devices. 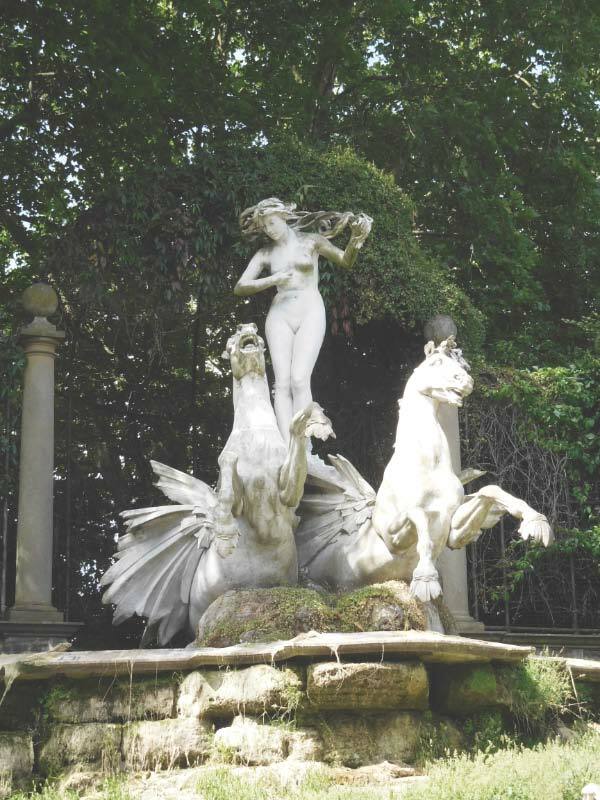 Among numerous other marvels, I’ve shown you the singing bird pistols that inspired a scene for one of my novellas, and surviving clockwork items originally exhibited in London in 1807. Susan has brought you—to name only two of many—a rope dancer and an automaton watch. Searching the tags “scientific marvels” and “automaton” will bring up more posts on these ingenious devices. Today, I offer you an egg. Most historical research for a novel involves words, and more words: letters, journals, diaries, and other books. But sometimes research means things: objects that were significant to my characters, and somehow survived: a tangible, magical link to the past. Despite the popular history myths, 18thc women didn't sew the their all the clothing that their families wore. Nor did they shear the sheep and harvest the flax, process all the fibers, spin the thread, and weave the cloth; even if you lived on the edge of the wilderness, there were skilled tradespeople who took care of all that, and merchants ready to supply their wares at every price point. But while creating jackets, breeches, and gowns was left to tailors and mantua-makers, women did make the less challenging items like baby clothes, neckcloths, handkerchiefs, shirts, and shifts at home. Sewing by hand was a useful skill, and considered a virtuously industrious one as well for women of every rank. But for many women, sewing was also a form of personal satisfaction and self-expression. The past (and the present!) is filled with women for whom sewing a neat, straight seam of perfectly even stitches or completing an intricate embroidery pattern is a matter of pride, accomplishment, and zen-like peace. Stitching for a special person could create a personal, even intimate, gift as well. Hand-made items can come with love and good wishes in every stitch. Eliza Schuyler Hamilton (the heroine of my new historical novel, I, Eliza Hamilton) enjoyed sewing, embroidery, and knitting. I've already shared one surviving example of her needlework, this lavish embroidered mat to display the miniature of her then-fiancee, Alexander Hamilton, made during the summer and fall when they were engaged but apart. Here are a pair of handkerchiefs that, by family tradition, were also made by Eliza, and carried by her and Alexander at their wedding in December, 1780. The larger handkerchief would have been Eliza's. Made of fine imported linen, it shows skilled cutwork over net inserts as well as precise stitching of the highest level, suitable for a special event like a wedding. (Given its size, I'm wondering if this might have been a neckerchief for wearing around the shoulders - a popular style in the 1780s - rather than a handkerchief, but since the archival description calls it a handkerchief, then so shall I.) Surviving, too, is the gentleman's handkerchief with an embroidered geometric pattern with floral accents. Again, the legend is that Eliza made the handkerchief for Alexander, a romantic gift that he must have treasured. Today the linen on the two handkerchiefs is yellowed and so fragile that they cannot be unfolded, but the beauty and the undeniable care (and likely love) that went into each one of those long-ago stitches remains. The fact that both pieces were set aside and treasured for more than two hundred years shows how special they must have been - and even now, in their special, acid-proof archival box, they're still stored together. Many thanks to Jennifer Lee, curator, Rare Book & Manuscript Library, Columbia University, for showing the neckerchief and the handkerchief to me. Above: Pair of wedding handkerchiefs, c1780, Alexander Hamilton Collection, Rare Book and Manuscript Library, Columbia University. Photographs ©2017 Susan Holloway Scott. 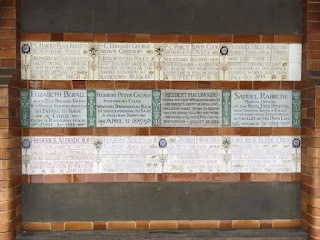 Before we embarked on our month-long stay in London, I had read about the Memorial to Heroic Self Sacrifice in Postman’s Park, and put it on my (very long) list of places to see. 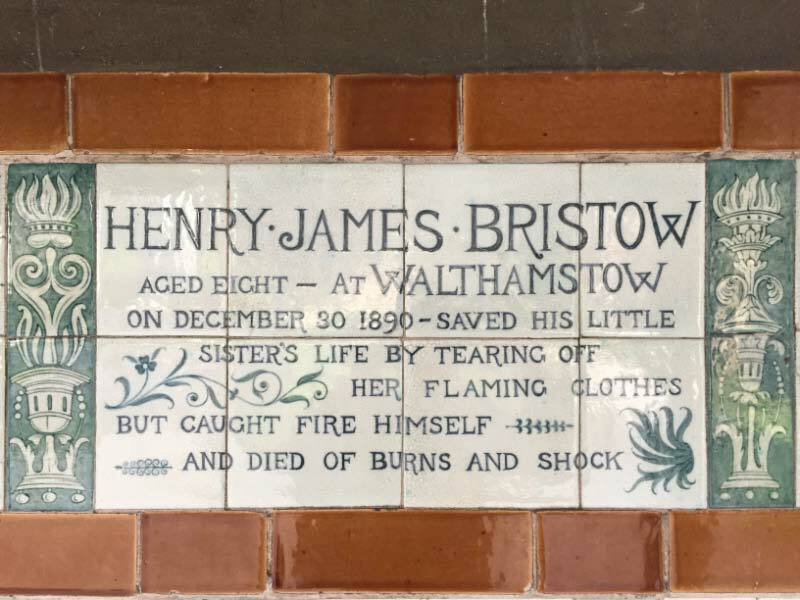 This is why, following our visit to the Museum of London one day, my husband and I walked a short distance to quiet little Postman’s Park, for a completely different kind of experience of history. The monuments for fallen military men, for political and military leaders, are easily found elsewhere. This memorial was meant for ordinary people who gave their lives to save others. 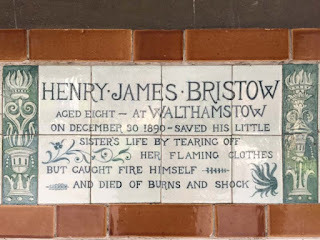 It was the idea of G.F. Watts, a Victorian painter and sculptor, to memorialize everyday heroes. His plan was for over a hundred ceramic plaques with the heroes’ names and their brave acts, but the memorial opened in 1900 with only four, and today seems to have stopped at fifty-four, though it appears that names will continue to be added over time. Even fifty-four, though, provide for a powerful experience. And it does grows heartbreaking, reading one brief, sad story after another. Still, there's something consoling, too, especially in times like ours, when there seems to be so much ill will in our world. The names on the tablets remind us that the best in human nature does triumph, and does so often. These tablets stand for countless unnamed everyday heroes who have acted unselfishly over the years. 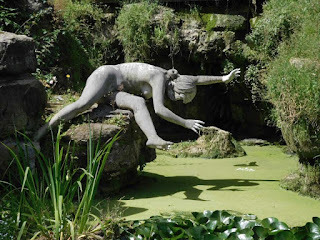 There are some, we can be sure, who are acting heroically at this very moment. You can move through a 3D image here, view large images here, and see examples of more detailed histories here at the Smithsonian site. Wikipedia provides a list of the tablets here. I'm a wandering writer. I don't have a desktop computer, or even a desk, let alone an office. Perhaps because I scribbled away at my first books on legal pads on commuter trains and while waiting at kids' sports practices, I can (well, most of the time) write wherever and whenever. With a laptop computer, it's easy enough, and even if that's not with me, I always have my smartphone for notes and ideas. It wasn't that way in 18thc America. The painting, left, is an illustration by Angelica Kauffman to one of the most popular novels of the 1780s: Emma Corbett, or, The Miseries of Civil War founded on Some Recent Circumstances which happened in America. The civil war in question was the American Revolution, and when Samuel Jackson Pratt published his novel in 1780, the "miseries" were real and current. Told in letters, the story concerns the tragedies faced by two families torn apart by the war - the first fictional work to describe both sides of the conflict. Here one of the novel's young women, Louisa Hammond, is shown writing a letter outdoors. While this makes for an elegant illustration, it also demonstrates the challenges of writing away from home. Writing on a single sheet of paper and using her portfolio, balanced on her knee, as an impromptu desk, Louisa holds an open bottle of ink in one hand, ready to dip her feather pen repeatedly as needed. Writing with an open bottle of ink seems a perilous act in a white dress. If the faithful dog at Louisa's feet is suddenly startled, or a breeze catches her hat and startles her, then there's a good chance that ink is going to splatter across her embroidered apron. 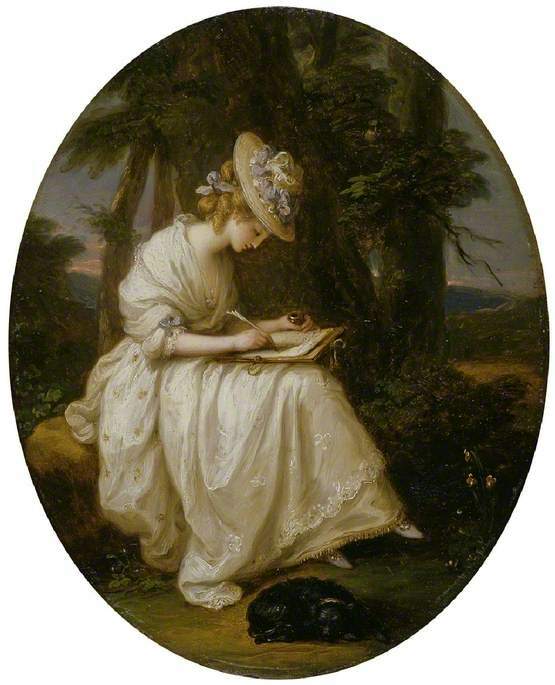 But while Louisa Hammond is a fictitious character, real people found a way to write away from home, too. 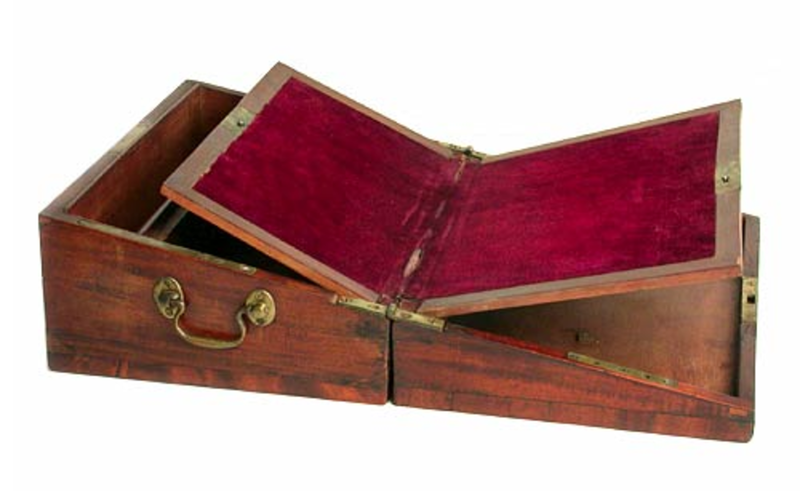 Most gentlemen who traveled frequently owned a portable desk. Basically a hinged wooden box, these desks were the predecessors of modern laptop. Designs varied to taste, but all have a surface covered in soft cloth (which made a quill pen move more easily over the page) for writing, plus compartments for storing bottles of ink, pens, paper, and other supplies. The desks folded and latched shut into a self-contained unit for carrying. This desk belonged to Alexander Hamilton, a real-life officer (unlike Louisa Hammond's true love) in the Continental Army who did survive the American Revolution. It's currently on view at the American Revolution Museum at Yorktown, VA as part of their exhibition AfterWARd: The Revolutionary Veterans Who Built America, through November 27, 2017. In the 1780s and after the war, Hamilton worked as a lawyer, frequently traveling by horseback and carriage for various cases around the state of New York. During this time, he also served as a representative to the Continental Congress and as a delegate to the Constitutional Convention, which meant more traveling between his home in New York City and, most often, Philadelphia - hundreds of miles on unpredictable roads, in good weather and bad. Hamilton was a ferociously prolific writer, full of ideas, opinions, and arguments, and blessed with the gift for words to express them. In an era before phones, being able to communicate through letters was vital. Wherever Hamilton went, this desk usually accompanied him. Made of Spanish mahogany with brass hinges, the desk is battered and well-worn from use. Tradition says that this was the desk on which Hamilton wrote the fifty-one essays that became his share of The Federalist Papers, and helped lead to the ratification of the Constitution. Striving to remove himself from the distractions of New York City in 1787, Hamilton and his wife Eliza traveled by packet up the Hudson River to Albany and The Pastures, the home of Eliza's family, the Schuylers. The length of the voyage was dependent on winds and currents, yet it must have given him uninterrupted days to think and write - something every writer craves. Upper left: Louisa Hammond by Angelica Kauffman, c1780s, Fitzwilliam Museum Collection. Right and lower left: Portable desk owned by Alexander Hamilton, American or English, late 18thc. Collection of Department of Special Collections, Burke Library, Hamilton College. Right photo courtesy of New-York Historical Society. Lower left photo ©2017 Susan Holloway Scott. • A bibliophile's guide to National Park libraries in America. • John Hancock's table: turtles, pineapples, and the paradoxical politics of 1768. • An Irish suffrage leader tours America in 1917. • Heartbreaking keepsake book made by a Jewish teen in 1941 for his boyfriend before he was murdered at Auschwitz. • Amazing librarians: the women who rode miles on horseback to deliver library books. • Image: "The 'New Woman" and her Bicycle" Puck Magazine, 1895. • How an 18thc orange-flavored dessert recipe created a modern political maelstrom. • What does that say? Deciphering 17th-18thc handwriting. • Ten common phrases that originated in the middle ages. • Newly digitized: Gertrude Bell's 1911 diary of her journey from Damascus to Aleppo via Baghdad. • America's first planetarium holds the ultimate cabinet of curiosities. • The Roman cemetery where Keats, Shelley, and other unfortunate international visitors are buried. • Image: This hairy beast is an 18thc man's muff. • An elegant, be-ribboned 1870s dress with a watery history. • Why was Benjamin Franklin estranged from his wife for nearly two decades? • The history of the ampersand. • A well-worn pair of men's striped trousers, dating from the 12th-14thc. • Seven flavors that any solider of the American Civil War would recognize. • This is what an 18thc feminist looked like. • Video: Just for fun: What happens when you fasten a GoPro camera on the blades of a windmill. 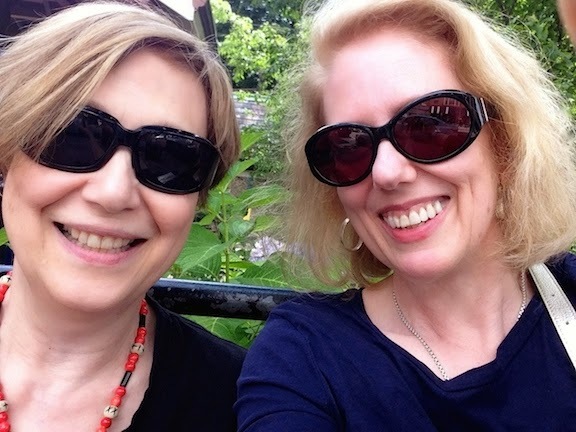 Author Donna Hatch, whom I finally met in London, recently shared a post on crinolines, which I in turn shared on Facebook. You may want to look at this piece while you peruse this month’s fashions. 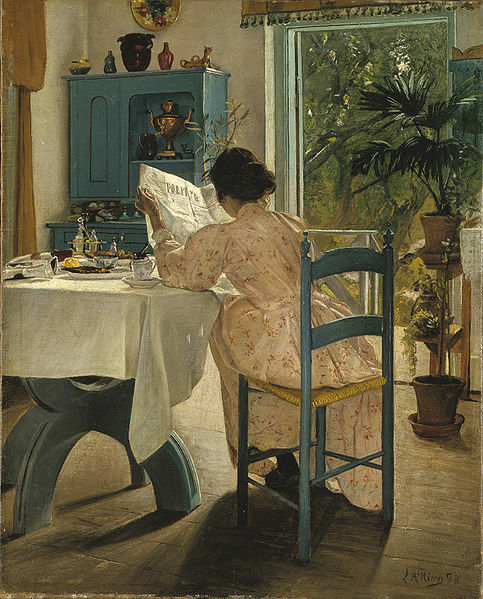 You’ll note that this dress, from the Met Museum’s collection, which appears in the article, bears a resemblance to the image from Plate 2 of the magazine. SECOND PLATE.—First Toilette. Dress of white coutil embroidered in black. The embroidery in this style of dress always affects the Greek style of ornament, is always based on a line and placed close to the hem. The Zouave jacket is much rounded, and embroidered in accordance with the skirt. Sleeves half-large, rounded, and open to the elbow. The chemisette and under-sleeves in strict accordance, even so far, that the wristbands and collar band are equally flat, plain, and close. Red cravat. A full sash of black lace, knotted behind, takes off from the perhaps too nautical appearance of this dress. The hat is in capital accordance with the entire dress; it is of leghorn straw, flat brim, band and edging of black velvet, ends of black lace, and black feathers. The chemisette must be very full to give due effect to the jacket. Second Toilette. Inasmuch as England sets France the fashion in men's apparel, we need barely refer to this toilette, but we may say it is peculiar from this fact, that not only is all the suit made of one material, but the hat also is en suite. The cravat is in bad taste, but the harmony of the suit and gloves is admirable. FOURTH PLATE.—First Toilette. 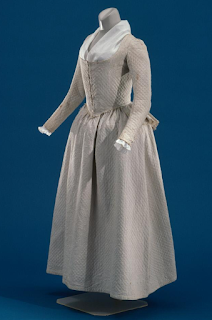 Dress of white muslin, trimmed with black lace insertion. 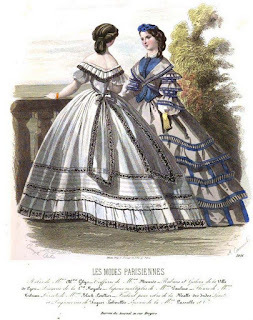 The skirt is trimmed with a flounce, and there is novelty in the application of a band of insertion lace, put above the hem of the flounce, which is headed with a fine puffing, over which is placed two narrow insertions, forming three narrow plaits. Bodice low; the berthe being in accord with the petticoat; small puffed sleeve, and each in perfect keeping with the dress; the ends very wide— a still prevalent mode. Writing a book seems to take forever, and the production - the edits, and rewrites, and galleys, and approving this and that and more - seems to take even longer. And then, suddenly, it's publication day, and your darling is thrust out into the world. OK, that's melodramatic, but at last it's that time for I, ELIZA HAMILTON, which will be available everywhere on September 26. If you'll be in the Philadelphia area this weekend, however, you'll be able to get your copy early at a very special booksigning at Sandy Hollow Heritage Park, Birmingham Township, PA.
What makes this booksigning special is that it will be part of Brandywine2017, a weekend-long re-enactment and celebration to mark the 240th anniversary of the Battle of Brandywine. (See my earlier blog posts about the battle here and here.) Fought on September 11, 1777, Brandywine was the largest land battle of the American Revolution, with approximately 26,000 combatants. George Washington commanded the Continental Army, and General William Howe led the British. The names of those on the field included many who would become well known in American history: the Marquis de Lafayette, generals Nathaniel Greene, Anthony Wayne, and Henry Knox, future President James Monroe, and future Supreme Court Chief Justice John Marshall. Oh, and there was also another young officer at the battle, serving as one of General Washington's aides-de-camp, who would one day become the first Secretary of the Treasury: Lt. Col. Alexander Hamilton. Can you understand now why I wanted this to be my first booksigning for I, ELIZA HAMILTON? 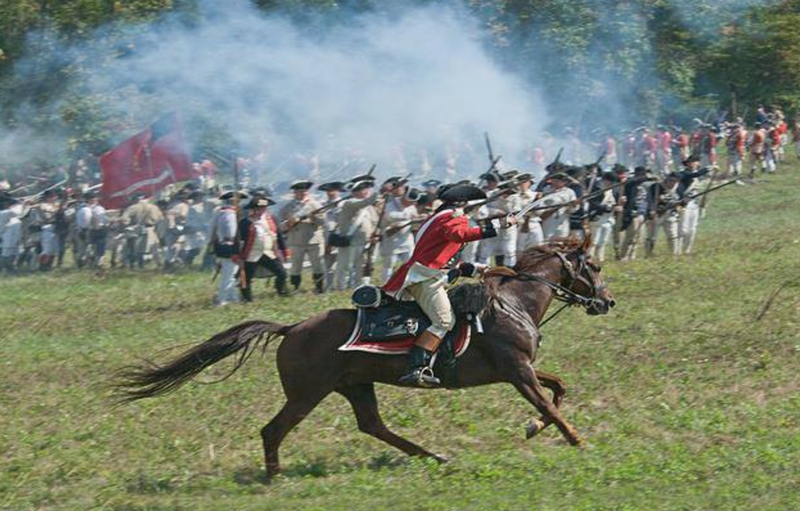 Nearly a thousand uniformed Revolutionary War re-enactors will gather from around the country to recreate the battle, fighting on the same fields and farmland as the original battle more than two centuries ago. There will infantry, cavalry, and dragoons, artillery demonstrations and military music. Before and after the "battles" (the British will win on Saturday, but the Americans will triumph on Sunday), visitors will be able to tour the encampments and meet the re-enactors, and step inside the handsewn replica of Washington's campaign headquarters tent. There will also be 18thc-style wares offered for sale by dozens of vendors and sutlers, as well as other authors, offering fiction, non-fiction, and children's books, all with a Revolutionary War connection. Perhaps best of all, the event is free, with plenty of free parking. Check out the the Brandywine2017 website for all the details, including directions. I'll be signing I, ELIZA HAMILTON on Saturday, September 16, from 11:00 am-1:00 pm, in the author tent near the entrance. Hope to see you there - please introduce yourself! A near-constant cycle of childbearing and nursing children was one of the realities of married life for most 18thc European and American women. 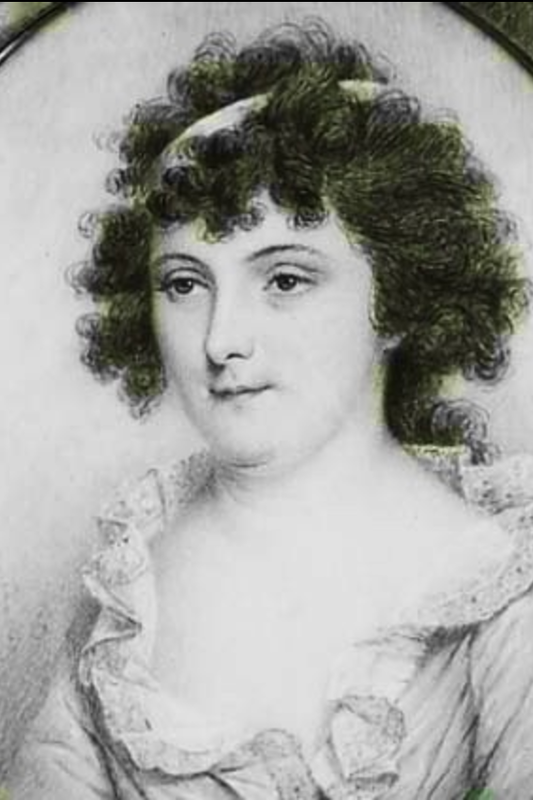 Elizabeth Schuyler Hamilton (1757-1854), the heroine of my new book I, Eliza Hamilton, was typical. Over the course of her twenty-three-year marriage to Alexander Hamilton, she was pregnant nine times, miscarried once, and bore eight children. She was much more fortunate than many of her contemporaries; all the Hamilton children survived to adulthood. Her mother, Catherine Van Rensselaer Schuyler (1734-1803) was sadly more typical: she bore fifteen children, seven of whom died as infants. Yet very little 18thc maternity clothing survives. There are several reasons for this: utilitarian clothing is much more rare, simply because it was worn until it was worn out. It wouldn't have been set aside and preserved the way that, say, an elaborate dress created for an elite woman for a court appearance might have been. Everyday clothing was refashioned and cut apart, remade and reused until, literally, nothing remained. Because textiles were expensive and valued, most women would not have owned garments that were designated exclusively as "maternity." Instead their ordinary clothing would simply be adapted to their changing figures. The drawstrings that formed the waistlines in petticoats (skirts) were let out. 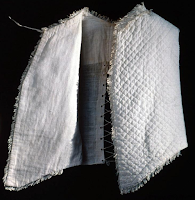 The front-closing bodices were usually held together by straight pins instead of buttons or other closures, and could easily be re-pinned to accommodate a changing figure. Triangular inserts called stomachers could be used to fill the widening space left in between, and adjustable lacings were another practical design feature. Other popular garments, like the t-shaped bedgowns, were sufficiently loose-fitting for pregnancy and nursing. The front-opening styles with deep necklines, in fashion for most of the 18thc, were also easily adapted for nursing mothers. 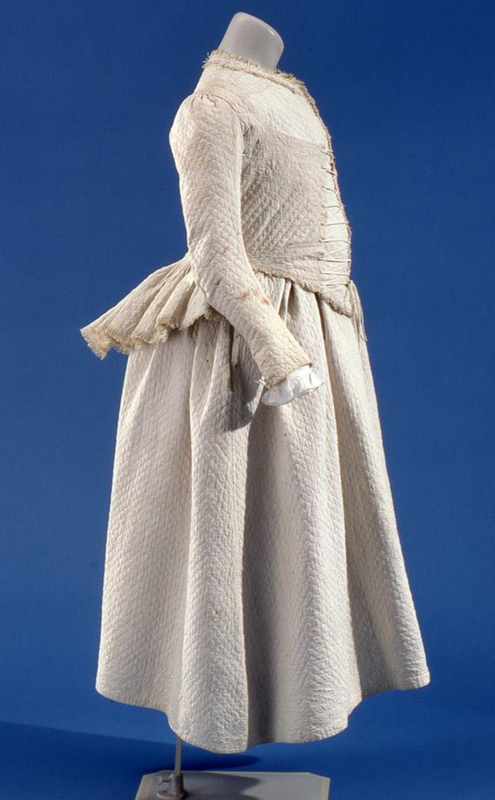 This rare three-piece ensemble from the collection of Colonial Williamsburg was likely designed by a woman (and her mantua-maker) for her own use before, during, and after pregnancy. 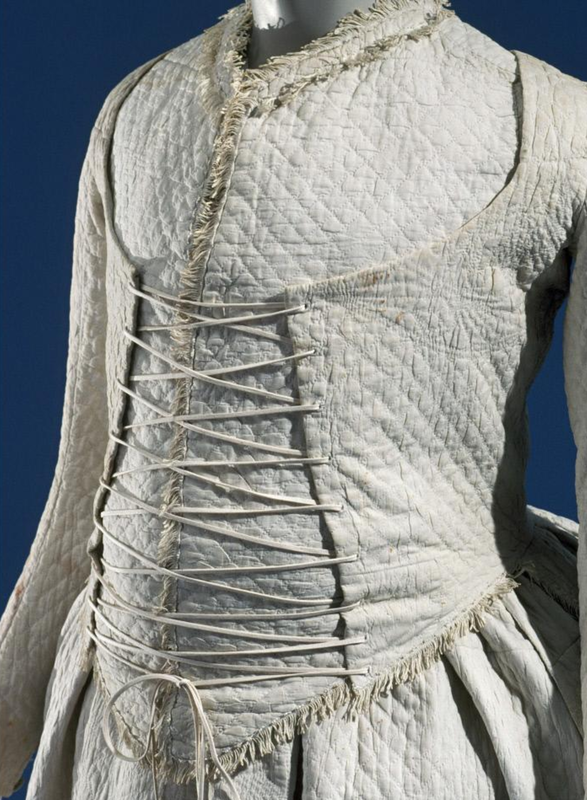 Cut from a diamond-quilted white cotton bed quilt, the old quilt's edging pattern was cleverly aligned to form an undulating border design along the hem of the petticoat. The drawstring at the petticoat's waist could easily expand, and would have been worn above the "baby bump." It's also likely that the fashionable mother-to-be wore the petticoat over a padded false bum for extra volume in the back of her skirts, and that she continued to wear her stays (corset) beneath an ensemble like this one. 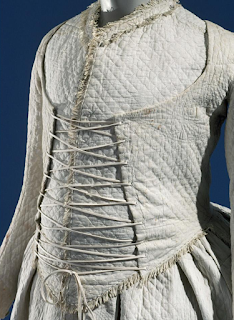 Most 18thc stays laced up the back, and the two sides were never intended to meet. During pregnancy, the lacing was simply widened to allow more space. 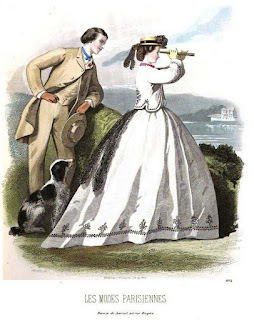 As always, the goal in the 18thc was not to achieve a tiny waist through tight lacing (as in the 19thc), but to maintain an erect posture and to create a silhouette that featured a straight front and narrow back. I'm sure most pregnant women skipped their stays while at home, but there were probably others who welcomed the familiar support that their stays offered. The jacket with its stylish back peplum and fringed trim closed with a zig-zagging cord at the center front. For non-pregnancy wear, upper right, the front edges were laced together to meet at the front, but as the woman's pregnancy progressed, the third piece of the ensemble, a sleeveless undervest, would have been worn beneath the jacket, lower right. The vest, middle left, was not only cut widely for a pregnant body, but also had a slit in the back like a man's waistcoat, adjustable with more lacing. The jacket's front lacings could have been widened, with the vest beneath filling in the now-open front. The layers would also provided welcome warmth - always a plus in drafty 18thc houses. While there are no records or contemporary descriptions of how Eliza Hamilton dressed during her pregnancies, I imagine that she, too, wore adaptable garments such as these, and that's how I described them in I, Eliza Hamilton. I suspect I'm not the only one inspired by this ensemble, either. The costume that's worn by the pregnant Eliza (played by Philippa Soo, and shown bottom left with Lin-Manuel Miranda as Alexander) in the musical Hamilton looks so much like the Colonial Williamsburg ensemble that I have to think the show's designer Paul Tazewell was aware of it, too. Many thanks to Neal Hurst, associate curator of costumes and textiles, Colonial Williamsburg, for his assistance with this post. Above: Women's quilted maternity ensemble, c1780-1795, collection of Colonial Williamsburg. • Confessions of a costume curator: what it's like to learn from dead people's clothing for a living. • The forgotten history of black chefs. • How to get breasts like apples: beauty hints for the early modern woman. • Forgotten victims of the French Revolutionary Wars: nearly 2,000 black & mixed race men, women, & children from the Caribbean were held as prisoners at Portchester Castle in Hampshire, England. • The United Palace Theater, a magnificent Jazz Age movie palace in New York City still hosts live performances. • Image: Mourning brooch of a deceased young man, c1860. • Tourist trinkets: the medieval pilgrimage badge. • You'll never be as radical as Benjamin Lay, an 18thc Quaker dwarf. • Knitting for victory: crafty women and the Great War. • The great Eclipse - the one that left his mark on the equine world in the 18thc. • Video: An elaborate traveling chest that contains tea-making equipment once belonged to Napoleon's daughter. • Emma Snodgrass, arrested in Boston in 1852 for wearing trousers. • Slow-churn democracy: ice cream in 18th-19thc America. • Archaeologists determine how castration affected the growth and skeleton of famous 18thc opera singer Farinelli. • Images: Andrew Jackson's coach, from his home, The Hermitage. • Treasonous magic in medieval and early modern England. • A c1876 scrapbook of sentimental memorabilia with hand-embroidered details. • Image: Parasol with steel mesh lining to protect Queen Victoria from assassin's bullets. This recent video from the Lady Lever Art Gallery and National Museums of Liverpool has been popular on social media, but it's so well-done that I'm sharing it here, too. A few things to keep in mind as you watch. The video is recreating the routine of an elite woman. With two maidservants to assist her, the mannered ritual of dressing is part of the luxury of the woman's fashionable (and costly) clothing. The time she spends being dressed - for she's remarkably passive in the process - reflects the leisure of her rank, and the entire process could be repeated during the course of a day. She might first be dressed in a riding habit in the morning, changed into a gown to receive friends at home for tea, and then again dressed into a more formal ensemble for the theatre or a ball, before finally being undressed for bed. The two maidservants are much more representative of what the majority of 18thc European and American women wore - and yet their clothing is not significantly less complicated. They're also wearing shifts, stays, petticoats, pockets, stockings, stomachers, aprons, kerchiefs, and caps. With less time at their disposal, however, they would have learned to dress themselves much more quickly than their fashionably idle mistress. Remember, too, that privacy is a modern concept, and that few 18thc women would have had a room to themselves. There would likely have been a mother, sister, or fellow servant nearby to help tie the laces on stays snug, or adjust the back of a cap. Practice makes perfect, and efficiency as well: women who dressed like this every day of their lives would have the routine down. I've watched some of my friends from Colonial Williamsburg - who wear 18thc clothing on a daily basis - and they dress with surprising speed. If you received this post via email, you may be seeing a black box or empty space where the video should be. Click here to view the video. As much as I love reading about history, there are times when the tangible scars of a long-ago incident are infinitely more memorable than a thousand written words. A long time ago (oh, in the last century or so), when I was still in elementary school, my parents took me to Historic Deerfield as part of a family vacation. All the details of that trip are long gone from my memory except for one incredibly powerful object: the "Old Indian House Door" from the 17thc Capt. John Sheldon House. The door survived the infamous 1704 Deerfield Raid by the French and their Native American allies, a massacre that killed fifty English men, women, and children, made captives of dozens of others, and left the town in ruins. The Sheldon House door stands as a mute testament to that harrowing day, with its broad beams hacked to form a ragged hole through which the French fired their muskets on the inhabitants. I recall the door being displayed complete with a tomahawk in place, but I might be imagining that. In any event, the door fed my nightmares for years. Still does. That door has yet to appear in any of my books, but I thought of it immediately while I was researching my new historical novel, I, Eliza Hamilton. I've written before about the Schuyler Mansion, the house in which my heroine Eliza Schuyler Hamilton was raised (here, here, here, and here.) Originally known as The Pastures in the 18thc, the elegant brick mansion was surrounded by a large estate that overlooked the Hudson River. But even The Pastures didn't entirely escape the American Revolution. Gen. Philip Schuyler, Eliza's father, first served in the Continental Army, and later in the war continued to advise his close friend Commander-in-Chief General George Washington. By the summer of 1781, the majority of the fighting had moved south, but the general's importance still made him a target to the enemy, and a small group of soldiers was assigned to the house to guard the general and his family. At the time, this included not only his wife Catharine and their younger children, but also his two older, married daughters, Angelica Church and Eliza Hamilton (both of whom were pregnant and visiting while their husbands were with the army), and Angelica's two children. On a warm evening in August, the house was attacked by a group of local Tories and Native Americans. While the guards attempted to fight them off, the family fled upstairs to barricade themselves in one of the bedchambers until help arrived. Too late Catharine Schuyler realized to her horror that her youngest child, a baby also named Catherine, had been left asleep downstairs. Bravely - or impulsively - the third daughter, twenty-two-year-old Margarita (better known as Peggy, and shown right in a later portrait) raced back downstairs to rescue her baby sister. Challenged by the attackers who were now ransacking the house, Peggy thought quickly, and told them that armed reinforcements were on the way from the town. As she raced up the stairs with her sister in her arms, one of the attackers swung a tomahawk at her, catching her skirts and and hacking a deep gouge into the banister. Soon afterward, reinforcements did indeed arrive, the general and his family were saved, and Peggy was lauded as a heroine. Today some of the details of the attack are suspected to have been 19thc embellishments. But there's no doubt that the raw tomahawk gouge remains in the banister, above left, carefully preserved over the centuries as proof. The gouge has grown wider over time as early 20thc visitors who were intrigued by the story carved out slivers of the railing for themselves as souvenirs. But as I ran my fingers over it, I couldn't help but picture brave Peggy Schuyler, her skirts flying and her baby sister wailing, as she faced down the enemy who'd dared attack her home. Left: Photograph of the Schuyler Mansion staircase, ©2017 Susan Holloway Scott. Right: Photograph detail of a miniature portrait of Magarita Schuyler Van Rensselaer by James Peale, c1796. Read more about Eliza Schuyler and Alexander Hamilton (and yes, Peggy as well) in my latest historical novel, I, Eliza Hamilton, now available everywhere.